The Emergency Medical Care & Rescue Department at the Durban University of Technology (DUT) are well-known for their ‘community rescue’ achievements, thanks to dedicated lecturers like Keanan Reynolds, who currently heads the technical and medical rescue at the DUT across all levels of the Bachelor of Health Sciences degree. The charismatic rescuer was part of the KwaZulu-Natal rescue teams, who was roped in to help save a newborn baby that was dumped in a stormwater drain in Newlands East on Monday, 11 February 2019. He has six years of experience where he has worked as an operational paramedic, as well as gaining experience as a flight paramedic on both fixed and rotor wing air aircraft. He is actively involved in technical rescues within the KwaZulu-Natal province. Speaking on the rescue operation which took three hours, Reynolds explained that the team of workers had to help dig a trench; which forms part of his specialised training in dealing with confined spaces, to rescue the newborn baby girl. “Also, as part of the KwaZulu-Natal Rescue teams, we provided a response and ultimately it was the multi-disciplinary teamwork that shone through,” he said. He also added that DUT students are also officially rooted in planned rescue operations as well, to give them more hands-on experience. However, he said, this operation he went on his own as it was an emergency and he was happy to be part of the team that helped to rescue the baby, who was stabilised and is now doing well in hospital. DUT’s Emergency Medical Care and Rescue, Head of Department, Dr Simpiwe Sobuwa, said: “The Departments Technical and Medical Rapid Response unit (TECHMED) manned by staff member Keanan Reynolds was called out this morning to assist in the rescue of a baby that appeared to be abandoned down a stormwater pipe. This service of providing assistance to the public free of charge falls within our mandate of community engagement while it provides a platform for teaching and learning. As very technical rescue skills and equipment was required for this exercise that may not routinely be available in industry on scene, Reynolds and TECHMED was called out. The Department prides itself in purchasing the latest and best available equipment for both medical and rescue training. I’m really happy about the outcome of the rescue and thank Reynolds for his commitment to not just teaching and learning but for his service to the community in times of need,” he said proudly. 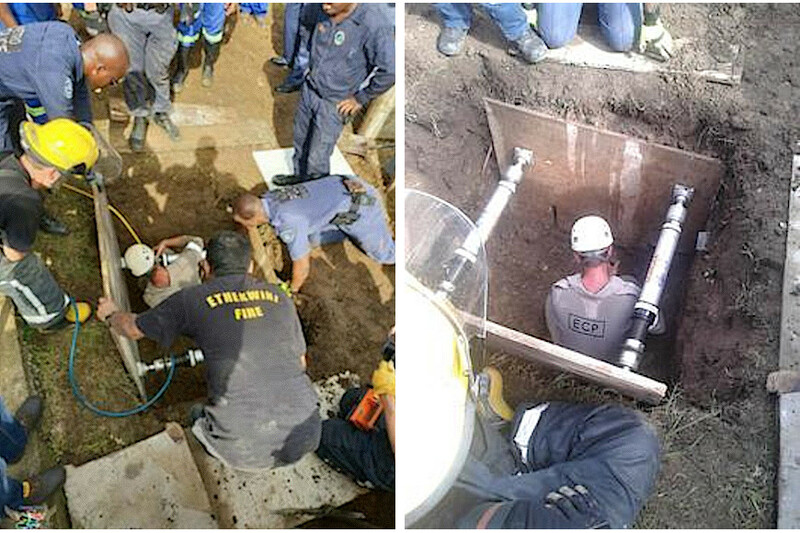 Pictured: DUT’s Keanan Reynolds helps to dig trench to rescue newborn baby.